Wow, was the Olympic Excellence Series really only 1 month ago?!!! Apparently getting motivated and inspired is easy. Staying motivated and inspired… that’s the hard part! Summer training is a back-to-basics time; volume, fitness and when you get intensity – it comes only on the back of lots of volume and fatigue. Makes competition season look pretty cushy!! This is usually a time to try to break bad habits and entrench new efficient motions. Which as we all know… is easier said than done. Here we show the Olympic Champion as at the pinnacle of Technical Achievement – the gold standard. 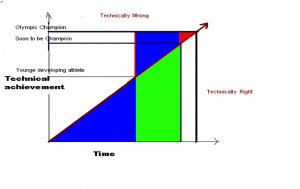 Under the diagonal line is everything an athlete IS DOING (DOING RIGHT); this increases and improves over time. Over the diagonal line is everything an athlete is NOT DOING (or DOING WRONG), this is decreasing over time as we close the gap on (and become!!!) the Olympic Champion. Unfortunately, as we all know, development is not this nice and linear – but we can dream! Johann used this chart to caution coaches from getting stuck spending “50%” of time coaching what an athlete is NOT doing (or DOING WRONG) for an entire career. Certainly a developing athlete (blue zones) has a lot to learn and, in comparison to the Olympic Champion, is doing a lot wrong. But an athlete who is about to become the Olympic Champion is doing far more right (green) than wrong (red). Johann suggested this needs to be reflected in coaching. An athlete’s motivation can get stuck the same way. Criticisms always linger longer than compliments, and it’s far too easy to get caught staring at the ‘red’ zone of what you AREN’T doing than remembering to be confident, motivated and inspired based on what you ARE doing. Don’t forget all that you have achieved in your ‘green’ zone!! Keep your (respectful) swagger! You’ve earned it. As you continue to develop as a top level athlete you will learn that inspiration and motivation are like puppies!! Everyone loves to have them around, but they aren’t so great with coming when told and aren’t so great at “STAY” either! I believe the trait for people who are career champions – those able to be successful time and time again – is that they don’t expect inspiration and motivation to come from the same place all the time. Sometimes they take motivation from the stuff they ARE doing (below the line) and sometimes it comes from what they ARE NOT yet doing (above the line). Some days you are inspired/ motivated A) to win, to be the best. B) to beat the people around you, C) to not be beaten. (three very different days!) Some days you are inspired/ motivated by the effort and talent of people around you. Some days you are not inspired at all but you are motivated because those people expect you to be there. Some days you are inspired/ motivated by the beauty and effort of your sport and because you know you are very, very good at something. For me… some days I’m motivated simply because people expect me to be motivated – so I have to dig and dig and find it – somewhere – in some bizarre little detail. Their expectations can save me on days when they know I have it… but I doubt it. So… here’s the summation – Yes – you should be looking at a tremendous amount of work in front of you, and it will require a fair bit of critical feedback, you will make mistakes and your motivation and inspiration will be tested. There is a lot that needs to be done in the next 250+ days for you to be successful. And – Yes- you are absolutely capable of doing it all because you have already come so far, and done so much. You have so many sources of motivation and inspiration in you and around you… Be the champion you are and use them all!! !